How does cadmium affect human health and the environment? This is a faithful summary of the leading report produced in 2010 by the United Nations Environment Programme (UNEP): " Final review of scientific information on cadmium"
In its elemental form, cadmium is a soft, silver-white metal. It is not usually present in the environment as a pure metal, but is most often found in zinc, lead, and copper ores. Cadmium is not an element that is used by the body, and it is toxic. It mainly affects kidneys and bones. It is also a carcinogen by inhalation. Cadmium can accumulate in liver, kidneys and bones, which may serve as sources of exposure later in life. Cadmium is produced mainly as a by-product of mining, smelting and refining of zinc and, to a lesser degree, as a by-product of lead and copper manufacturing. 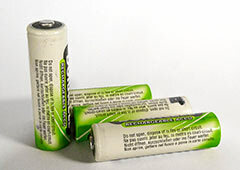 Most of the cadmium produced is used in the production of nickel-cadmium batteries, which in 2004 represented 81 per cent of the total amount of cadmium. Other major uses of refined cadmium are: pigments for plastics, ceramics and enamels; stabilizers for plastics; plating on iron and steel; and as an element of some lead, copper and tin alloys. Since 1990, consumption for pigments, stabilizers, alloys and other uses has decreased significantly. Cadmium is released by various natural and anthropogenic sources to the atmosphere, the aquatic and terrestrial environments, mostly in the form of particles. Cadmium can be released naturally by volcanoes or by the weathering of rocks; it can also come from human activities, namely mining and the production, use and disposal of products containing cadmium. Once it is in the environment it can remain present for a long time. It can be transported from one location to another, in particle forms that are either blown by the wind of washed away by water. The most recent study of global human emissions of cadmium estimated the total to be around 3000 tons. Natural sources are difficult to assess, and estimations vary greatly. It is however thought that natural emissions are much higher than human emissions. As awareness of the adverse impacts of cadmium has increased, many uses have been reduced significantly in industrialized countries, and waste management systems have been put in place to limit the release of cadmium into the environment. In contrast, in some developing countries, some uses are increasing, and products containing cadmium are not typically collected separately from the general waste stream. Therefore cadmium discards will end up in municipal waste and disposed of in landfills, incineration, open burning or indiscriminate dumping. Some of the cadmium in these products will be released to the environment. The critical health effect of cadmium is on the kidneys where it damages the blood filtration system of the kidneys, which results in proteins being excreted in urine. The severity of the effects depends on duration and magnitude of exposure. Skeletal damage is another critical effect of long term exposure to cadmium at levels somewhat higher than those for which kidney problems occur. When it is breathed in, cadmium can cause lung cancer. It doesn’t seem to cause cancer when it is ingested. Cadmium is mainly stored in the liver and kidneys. Excretion is slow, with a very long half-life (decades) in the human body. Cadmium concentrations in most tissues increase with age. Cadmium is a non-essential heavy metal, meaning that it is not used by biological systems. Both in aquatic and terrestrial ecosystems it tends to bioaccumulate, particularly in vertebrates, and specifically in organs such as the kidney and liver, and it also accumulate builds up in invertebrates, algae and plants. Effects on birds and mammals are mainly due to kidney damage. Improving the assessment and reporting of releases and exposures, especially for developing countries, and understanding the inconsistencies between official numbers for releases and the amount of cadmium that is observed in the environment. Better assessment of the extent of risks to humans, the ecosystem or animals from exposure to cadmium, the role of long-range environmental transport, the contribution of anthropogenic versus natural sources and the influence of local, regional, and global sources.